I just returned from a fabulous visit with friends who live in a coastal town. How wonderful it is to be able to visit the ocean on a moments' notice. The memories of the sea, sand, surf and shells inspired me to get out my stash and make something with my treasures from the ocean . 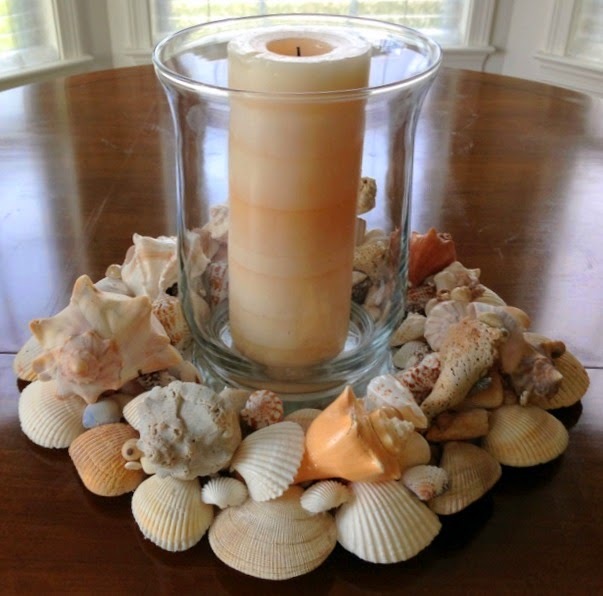 . . a centerpiece candleholder using all shapes and sizes of shells resting on one another. 1. Cut out circles using a plastic bowl top as a template from foam board (1) and cardboard (2). 2. Applied tacky glue and fused the foam board between the two cardboard circles. 3. Drew a circle around the candleholder so I would know where not to place the shells. 4. Started hot gluing shells on the edge of the base. 5. Continued adding shells, switching to E6000 for a more permanent bond. 6. Painted the circle with white pearl acrylic. The finished centerpiece is about 15 inches in diameter and looks very beachy. Surrounded by netting, it's rather chic! Won't you indulge your love of the ocean and all its' treasures with a seashell themed centerpiece . . . giving you your own little piece of coastal living. Wow, Gail, another lovely sea design. I bet this looks great near the starfish anchor you made. What a beautiful center piece! Gail you have finesse! If I glued shells together it would never look this good! Beautifully done! How pretty!! Makes me want to go to the beach. :) Pinning it! Oh how pretty, my Mother in Law lives right on the ocean front this would be great to make at her place, looking for shells then making the centrepiece. 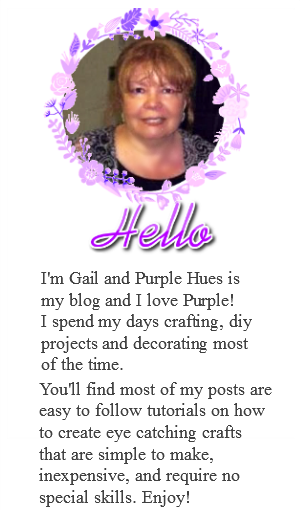 That is so lovely Gail! What a beautiful centre piece to any table. That is gorgeous! My sister lives in Florida and has all sorts of seashell decorations. I just loe them and this is lovely. Stopping by from Table It party. Gail, you've just got the touch! Very chic indeed! I have to pull my seashells out and find a bit of net now. Now, where did I put my seashells. I love your centerpiece. The colors are great and it's so reminiscent of fun summer beach trips. Oh Gail - that turned out gorgeous - and just what I need for my outdoor table as a cente rpiece !!! Ohhh did you bring back memories! Several hundred years ago living in south florida I made a wreath almost exactly like that for my mom on Mothers Day. It's funny to remember that because it was too heavy to hang so she HAD to use it as a candle ring....Love it Gail! Oh I love this!! What a beautiful way to remember your time at the beach!! What a cute idea, Gail! That piece would cost a pretty penny in those beachy home decor shops! I love bringing back treasures from our beach vacations! This is a keeper for sure! So pretty - and I'm always collecting shells. I like this idea for summer! This center piece is really gorgeous! So pretty for summer! You are amazing! Thanks for sharing! Oh I love your shell candle holder. It is fabulous. The fish sounds so good with the onion rings, now I want some too. 1000% professional job! I have seen similar ones in a couple of specialty boutiques, but yours is much fuller which makes it look so much nicer! I know this must have taken a little time to accomplish, so my hat's off to you. I don't have a very long attention span at all! Great post! I'm headed over to see that starfish anchor now! 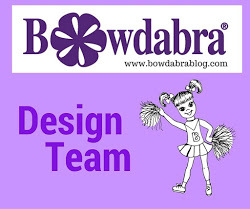 Thank you for sharing your gorgeous project at the Say G'day Saturday linky party. 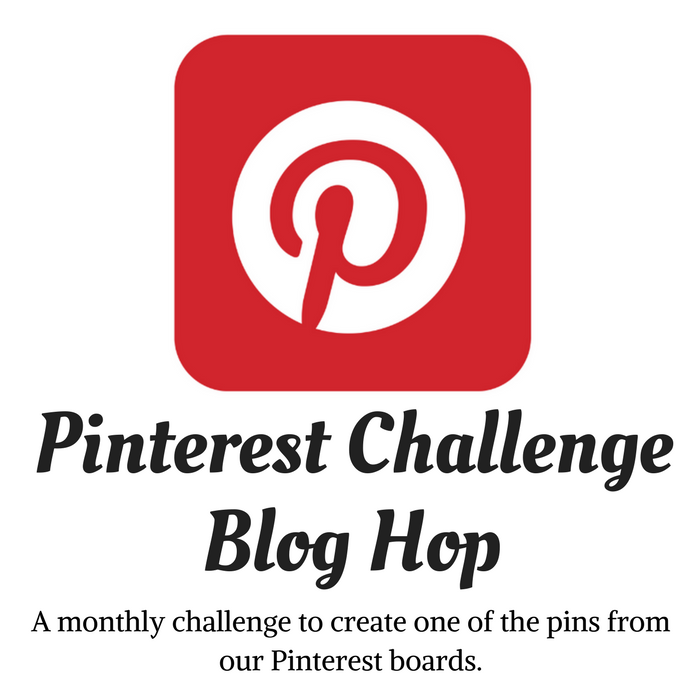 I have pinned this post and am going to give it a try! Hope you can join us again this Saturday! Congrats your project was MOST VIEWED at our Link it or Lump it party! Stop by and grab a feature button!